The Diemme MicroFlex direct flow filtration process reduces filtration times, increases cartridge life, and maximizes the quality of the filtered product. 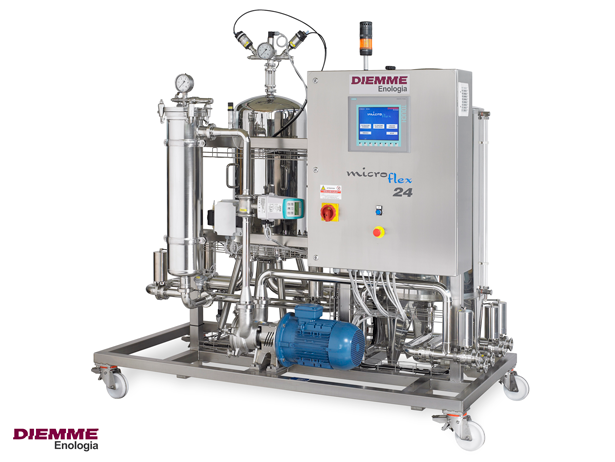 Diemme MicroFlex direct flow filtration process reduces filtration times, increases cartridge life, and maximizes the quality of the filtered product. Diemme’s MicroFlex system utilizes the patented IntelliFlex software. The IntelliFlex software continuously analyzes the filtering conditions and adjusts the filtration parameters as needed in order to optimize the filtration process. The MicroFlex technology utilizes less energy, costs less per liter filtered, operates at significantly lower pressures, and produces higher quality filtered product than cross-flow filtration. The MicroFlex system uses standard code 7, 30” cartridges. The MicroFlex filtration system is offered in 12, 24, or 48 cartridge units capable of filtering from 1,800 – 24,000 liters/hour.